Please update us with any information you have. You can leave a note in our Guestbook or email us. Mike checked out the Teanaway Monday. The West Fork road is blocked by snow 1/4 mile below the Gate. The North Fork road has been plowed beyond the Guard Shack just above the Stafford Creek intersection. about. Please pass on the information about these closures to equestrians. forward it to all of you. 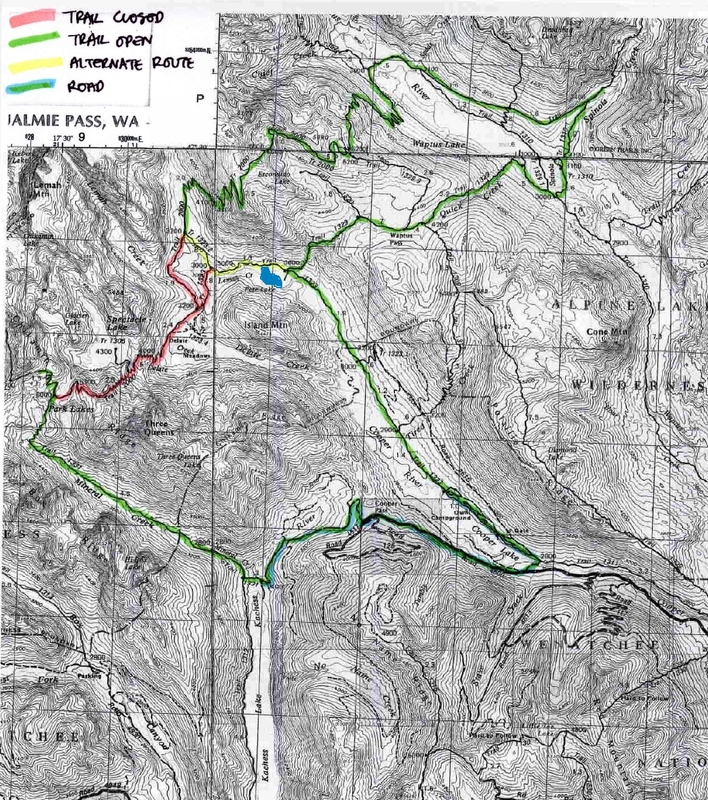 "Alpine Lakes Wilderness PCT Closure"
CAMPGROUND CLOSURE INFORMATION: Salmon la Sac Campground and Cayuse Horse Camp will be closed this summer to make much needed repairs and updates. Work began in Salmon la Sac Campground in the fall of 2005 with the replacement of the existing bathrooms with new vault toilets. This summer (2006) work will continue to address the aging water system that services both campgrounds. Salmon la Sac and Cayuse Horse Camp were constructed by CCC crews in the 1930's. Generations of families and friends have enjoyed camping in these campgrounds. The work we accomplish this summer will allow those traditions to continue; hopefully with a higher quality experience. Salmon la Sac and Cayuse are scheduled to re-open for the 2007 camping season.